A portrait of a seated man wearing a white bead neck ornament and smoking a long pipe with its bowl decorated with bands of white. 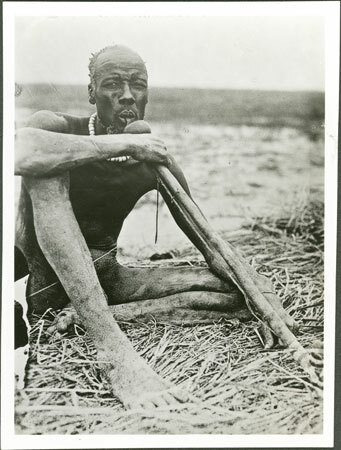 Although he is described in The Nuer as a man of Zeraf River, suggesting a Gaawar, Thiang or Lak tribesman, on the second (probably original) print reverse he is described as a Law (Lou) 'chief of blood'.This photograph was most likely taken in the 1920s, possibly by its original owner Talib Ismail, a Sudanese sub-mamur at Akobo in Upper Nile Province from 1920-27. Ismail's base of Akobo also points to a Lou identity. Morton, Chris. "Nuer man smoking pipe" Southern Sudan Project (in development). 03 Jan. 2006. Pitt Rivers Museum. <http://southernsudan.prm.ox.ac.uk/details/1998.346.345.1/>.